Provides horse owners worldwide with safe, effective control against a broad spectrum of internal parasites, including bots. Numerous research trials have demonstrated the safety and effectiveness of moxidectin in breeding mares, stallions, and foals four months of age or older. 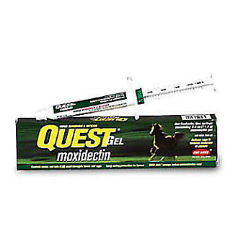 Quest delays reappearance of strongyle eggs for 84 days, permits parasite and bot control with only four treatments per year, is the only dewormer that kills small strongyles in the encysted state with a single dose, and is formulated as an easy-to-use, clear gel that offers less mess and less stress on horses and their owners.